Filmmaking can seem like a daunting task, especially for the first time filmmaker. When you’re a teenager, that process seems even more intimidating. 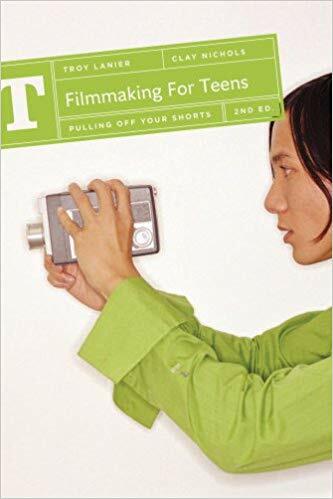 In Filmmaking For Teens: Pulling Off Your Shorts 2nd Edition, Troy Lanier and Clay Nichols try to simplify the process by breaking it down to its bare bones. The beauty of this book is that Lanier and Nichols know their audience. They come across as funny and down-to-earth in order to relate with their readers and avoid sounding like they are lecturing them. From the very beginning of Chapter One, Lanier and Nichols choose to acknowledge the fact that teenagers are individuals who may not like to follow rules. They take this generalisation and run with it for the whole book. Teenagers have a shorter attention span and the authors realise this. At the end of each chapter, a “reshoot” section is included to give a quick recap of each chapter’s main idea. This gives the reader an even better breakdown of what’s absolutely necessary when it comes to the filmmaking process. Additionally, the book is full of useful tips and exercises to get the reader’s film concept created, screenplay done, and get an ideal number of crew members together. One such example of a useful exercise is what the authors call “blab.” In this exercise, the teen would give themselves 10 minutes to write whatever comes to mind. They tell the reader to just keep writing no matter how nonsensical the ideas or words may seem. This concept of “blabbing” can lead to unexpected ideas. This exercise discourages teens from relying on typical clichés as ideas during conceptualisation and gets them to develop brilliant and refreshing ones. Lanier and Nichols even manage to make the editing process seem like a breeze. What is usually the longest part of the filmmaking process is simplified so that teens can get it done as quickly and painlessly as possible. In doing so, they make sure the readers’ films keep moving forward. Overall, the authors want to make sure that their readers finish their shorts and set a deadline to do so. The book is their way to motivate teenagers to get a move on and actually accomplish their goal. It suggests setting a festival’s entry date as the deadline for completing the film. The authors then give useful information on how to submit the films, market them, and eventually distribute them. In the end, Filmmaking For Teens doesn’t try to be something it’s not. The book isn’t trying to be the end-all-be-all authority on how to make a short film. It is a simple, easy read that gives good insight into the process of filmmaking without becoming overwhelming. It gives teens the things they absolutely must know and skips over the things they don’t. This book is a great starting point for young filmmakers looking to gain insight into the world of film. Lanier and Nichols’ main goal is to get the dreamers who love films off the couch and behind the camera, and any teen who reads this book can succeed in doing just that.